Arlington Street, Aug. 1, 1746. I am this moment come from the conclusion of the greatest and most melancholy scene I ever yet saw you will easily guess it was the trials of the rebel Lords. As it was the most interesting sight, it was the most solemn and fine: a coronation is a puppet-show, and all the splendour of it idle; but this sight at once feasted one’s eyes and engaged all one’s passions. It began last Monday; three parts of Westminster-hall were inclosed with galleries, and hung with scarlet; and the whole ceremony was conducted with the most awful solemnity and decency, except in the one point of leaving the prisoners at the bar, amidst the idle curiosity of some crowd, and even with the witnesses who had sworn against them, while the Lords adjourned to their own House to consult. No part of the royal family was there, which was a proper regard to the unhappy men, who were become their victims. One hundred and thirty-nine Lords were present, and made a noble sight on their benches frequent and full! The Chancellor was Lord High Steward; but though a most comely personage with a fine voice, his behaviour was mean, curiously searching for occasion to bow to the minister that is no peer, and consequently applying to the other ministers, in a manner, for their orders; and not even ready at the ceremonial. To the prisoners he was peevish; and instead of keeping up to the humane dignity of the law of England, whose character it is to point out favour to the criminal, he crossed them, and almost scolded at any offer they made towards defence. I had armed myself with all the resolution I could, with the thought of their crimes and of the danger past, and was assisted by the sight of the Marquis of Lothian in weepers for his son who fell at Culloden — but the first appearance of the prisoners shocked me! their behaviour melted me! Lord Kilmarnock and Lord Cromartie are both past forty, but look younger. Lord Kilmarnock is tall and slender, with an extreme fine person: his behaviour a most just mixture between dignity and submission; if in any thing to be reprehended, a little affected, and his hair too exactly dressed for a man in his situation; but when I say this, it is not to find fault with him, but to show how little fault there was to be found. Lord Cromartie is an indifferent figure, appeared much dejected, and rather sullen: he dropped a few tears the first day, and swooned as soon as he got back to his cell. For Lord Balmerino, he is the most natural brave old fellow I ever saw: the highest intrepidity, even to indifference. At the bar he behaved like a soldier and a man; in the intervals of form, with carelessness and humour. He pressed extremely to have his wife, his pretty Peggy, with him in the Tower. Lady Cromartie only sees her husband through the grate, not choosing to be shut up with him, as she thinks she can serve him better by her intercession without: she is big with child and very handsome; so are their daughters. When they were to be brought from the Tower in separate coaches, there was some dispute in which the axe must go — old Balmerino cried, “Come, come, put it with me.” At the bar, he plays with his fingers upon the axe, while he talks to the gentleman-gaoler; and one day somebody coming up to listen, he took the blade and held it like a fan between their faces. During the trial, a little boy was near him, but not tall enough to see; he made room for the child and placed him near himself. When the trial began, the two Earls pleaded guilty; Balmerino not guilty, saying he could prove his not being at the taking of the castle of Carlisle, as was laid in the indictment. Then some witnesses were examined, whom afterwards the old hero shook cordially by the hand. The Lords withdrew to their House, and returning demanded, of the judges, whether one point not being proved, though all the rest were, the indictment was false? to which they unanimously answered in the negative. Then the Lord High Steward asked the Peers severally, whether Lord Balmerino was guilty! All said, “guilty upon honour,” and then adjourned, the prisoner having begged pardon for giving them so much trouble. Are not you charmed with this speech? how just it was as he went away, he said, “They call me Jacobite; I am no more a Jacobite than any that tried me: but if the Great Mogul had set up his standard, I should have followed it, for I could not starve.” The worst of his case is, that after the battle of Dumblain, having a company in the Duke of Argyll‘s regiment, he deserted with it to the rebels, and has since been pardoned. Lord Kilmarnock is a presbyterian, with four earldoms in him, but so poor since Lord Wilmington’s stopping a pension that my father had given him, that he often wanted a dinner. Cromartie was receiver of the rents of the King’s second son in Scotland, which, it was understood, he should not account for; and by that means had six hundred a-year from the Government: Lord Elibank, a very prating, impertinent Jacobite, was bound for him in nine thousand pounds, for which the Duke is determined to sue him. When my Lady Townshend heard her husband vote, she said, “I always knew my Lord was guilty, but I never thought he would own it upon his honour.” Lord Balmerino said, that one of his reasons for pleading not guilty, was, that so many ladies might not be disappointed of their show. On Wednesday they were again brought to Westminster-hall, to receive sentence; and being asked what they had to say, Lord Kilmarnock, with a very fine voice, read a very fine speech, confessing the extent of his crime, but offering his principles as some alleviation, having his eldest son (his second unluckily was with him,) in the Duke’s army, fighting for the liberties of his country at Culloden, where his unhappy father was in arms to destroy them. He insisted much on his tenderness to the English prisoners, which some deny, and say that he was the man who proposed their being put to death, when General Stapleton urged that he was come to fight, and not to butcher; and that if they acted any such barbarity, he would leave them with all his men. He very artfully mentioned Van Hoey’s letter, and said how much he should scorn to owe his life to such intercession. 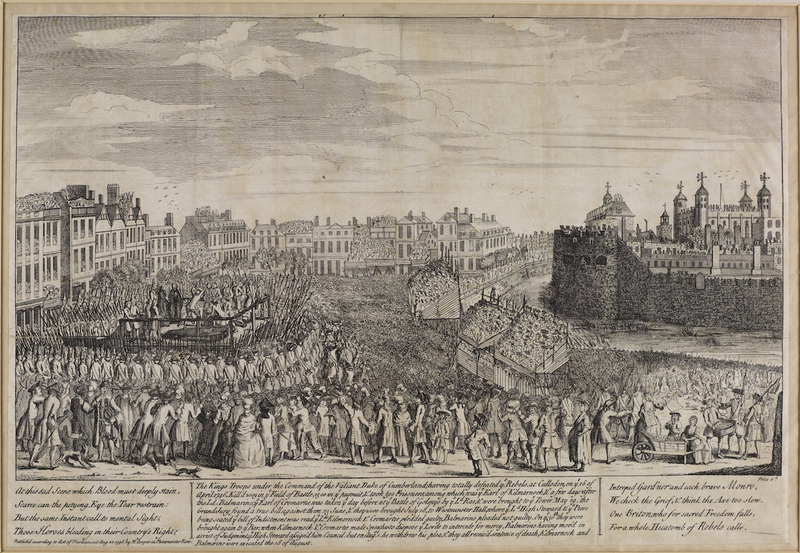 That morning a paper had been sent to the lieutenant of the Tower for the prisoners; he gave it to Lord Cornwallis, the governor, who carried it to the House of Lords. It was a plea for the prisoners, objecting that the late act for regulating the trial of rebels did not take place till after their crime was committed. The Lords very tenderly and rightly sent this plea to them, of which, as you have seen, the two Earls did not make use; but old Balmerino did, and demanded council on it. The High Steward, almost in a passion, told him, that when he had been offered council, he did not accept it. Do but think on the ridicule of sending them the plea, and then denying them council on it! The Duke of Newcastle, who never lets slip an opportunity of being absurd, took it up as a ministerial point, in defence of his creature the Chancellor; but Lord Granville moved, according to order, to adjourn to debate in the chamber of Parliament, where the Duke of Bedford and many others spoke warmly for their having council; and it was granted. I said their, because the plea would have saved them all, and affected nine rebels who had been hanged that very morning; particularly one Morgan, a poetical lawyer. Lord Balmerino asked for Forester and Wilbraham; the latter a very able lawyer in the House of Commons, who, the Chancellor said privately, he was sure would as soon be hanged as plead such a cause. But he came as council to-day (the third day), when Lord Balmerino gave up his plea as invalid, and submitted, without any speech. The High Steward then made his, very long and very poor, with only one or two good passages; and then pronounced sentence! Great intercession is made for the two Earls: Duke Hamilton, who has never been at court, designs to kiss the King’s hand, and ask Lord Kilmarnock’s life. The King is much inclined to some mercy; but the Duke, who has not so much of Caesar after a victory, as in gaining it, is for the utmost severity. Arlington Street, Aug. 5, 1746. (…) Lady Cromartie presented her petition to the King last Sunday. He was very civil to her, but would not at all give her any hopes. She swooned away as soon as he was gone. Lord Cornwallis told me that her lord weeps every time any thing of his fate is mentioned to him. Old Balmerino keeps up his spirits to the same pitch of gaiety. In the cell at Westminster he showed Lord Kilmarnock how he must lay his head; bid him not wince, lest the stroke should cut his skull or his shoulders, and advised him to bite his lips. I am assured that the old Countess of Errol made her son Lord Kilmarnock go into the rebellion on pain of disinheriting him. I don’t know whether I told you that the man at the tennis-court protests that he has known him dine at the man that sells pamphlets at Storey’s Gate; “and,” says he, “he would often have been glad if I would have taken him home to dinner.” He was certainly so poor, that in one of his wife’s intercepted letters she tells him she has plagued their steward for a fortnight for money, and can get but three shillings. Arlington Street, Aug. 11, 1746. Arlington Street, Aug. 12, 1746. We know nothing certainly of the young Pretender, but that he is concealed in Scotland, and devoured with distempers: I really wonder how an Italian constitution can have supported such rigours! He has said, that “he did not see what he had to be ashamed of; and that if he had lost one battle, he had gained two.” Old Lovat curses Cope and Hawley for the loss of those two, and says, if they had done their duty, he had never been in this scrape. Cope is actually going to be tried; but Hawley, who is fifty times more culpable, is saved by partiality: Cope miscarried by incapacity; Hawley, by insolence and carelessness. Indeed Lord Cromartie does not much deserve the epithet; for he wept whenever his execution was mentioned. Balmerino is jolly with his pretty Peggy. There is a remarkable story of him at the battle of Dunblain, where the Duke of Argyll, his colonel, answered for him, on his being suspected. He behaved well; but as soon as we had gained the victory, went off with his troop to the Pretender; protesting that he had never feared death but that day, as he had been fighting against his conscience. Popularity has changed sides since the year ’15, for now the city and the generality are very angry that so many rebels have been pardoned. 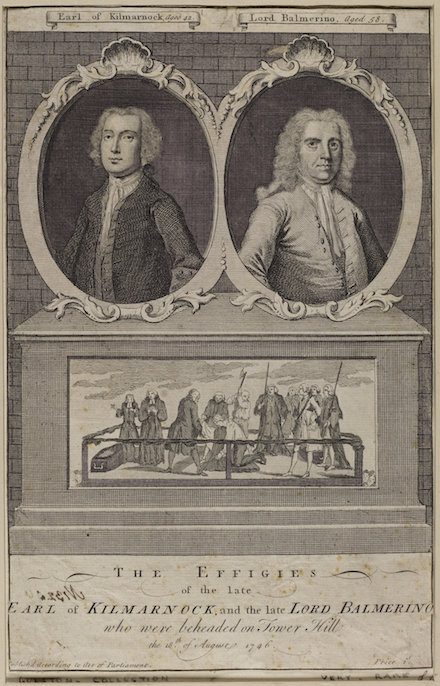 Some of those taken at Carlisle dispersed papers at their execution, saying they forgave all men but three, the Elector of Hanover [i.e., King George II], the pretended Duke of Cumberland, and the Duke of Richmond, who signed the capitulation at Carlisle. Arlington Street, Aug. 16, 1746. (…) I have been this morning at the Tower, and passed under the new heads at Temple Bar, where people make a trade of letting spying-glasses at a halfpenny a look. Old Lovat arrived last night. I saw Murray, Lord Derwentwater, Lord Traquair, Lord Cromartie and his son, and the Lord Provost, at their respective windows. The other two wretched Lords are in dismal towers, and they have stopped up one of old Balmerino’s windows because he talked to the populace; and now he has only one, which looks directly upon all the scaffolding. They brought in the death-warrant at his dinner. His wife fainted. He said, “Lieutenant, with your damned warrant you have spoiled my lady’s stomach.” He has written a sensible letter to the Duke to beg his intercession, and the Duke has given it to the King; but gave a much colder answer to Duke Hamilton, who went to beg it for Lord Kilmarnock: he told him the affair was in the King’s hands, and that he had nothing to do with it. Lord Kilmarnock, who has hitherto kept up his spirits, grows extremely terrified. I came from town (for take notice, I put this place upon myself for the country) the day after the execution of the rebel Lords: I was not at it, but had two persons come to me directly who were at the next house to the scaffold; and I saw another who was upon it, so that you may depend upon my accounts. Just before they came out of the Tower, Lord Balmerino drank a bumper to King James’s health. As the clock struck ten they came forth on foot, Lord Kilmarnock all in black, his hair unpowdered in a bag, supported by Forster, the great Presbyterian, and by Mr. Home, a young clergyman, his friend. Lord Balmerino followed, alone, in a blue coat turned up with red, his rebellious regimentals, a flannel waistcoat, and his shroud beneath; their hearses following. They were conducted to a house near the scaffold; the room forwards had benches for spectators; in the second Lord Kilmarnock was put, and in the third backwards Lord Balmerino; all three chambers hung with black. Here they parted! Balmerino embraced the other, and said, “My lord, I wish I could suffer for both!” He had scarce left him, before he desired again to see him, and then asked him, “My Lord Kilmarnock, do you know any thing of the resolution taken in our army, the day before the battle of Culloden, to put the English prisoners to death?” He replied, “My lord, I was not present; but since I came hither, I have had all the reason in the world to believe that there was such order taken; and I hear the Duke has the pocketbook with the order.” Balmerino answered, “It was a lie raised to excuse their barbarity to us.” –Take notice, that the Duke’s charging this on Lord Kilmarnock (certainly on misinformation) decided this unhappy man’s fate! The most now pretended is, that it would have come to Lord Kilmarnock’s turn to have given the word for the slaughter, as lieutenant-general, with the patent for which he was immediately drawn into the rebellion, after having been staggered by his wife, her mother, his own poverty, and the defeat of Cope. He remained an hour and a half in the house, and shed tears. At last he came to the scaffold, certainly much terrified, but with a resolution that prevented his behaving in the least meanly or unlike a gentleman. He took no notice of the crowd, only to desire that the baize might be lifted up from the rails, that the mob might see the spectacle. He stood and prayed some time with Forster, who wept over him, exhorted and encouraged him. He delivered a long speech to the Sheriff, and with a noble manliness stuck to the recantation he had made at his trial; declaring he wished that all who embarked in the same cause might meet the same fate. He then took off his bag, coat and waistcoat with great composure, and after some trouble put on a napkin-cap, and then several times tried the block; the executioner, who was in white with a white apron, out of tenderness concealing the axe behind himself. At last the Earl knelt down, with a visible unwillingness to depart, and after five minutes dropped his handkerchief, the signal, and his head was cut off at once, only hanging by a bit of skin, and was received in a scarlet cloth by four of the undertaker’s men kneeling, who wrapped it up and put it into the coffin with the body; orders having been given not to expose the heads, as used to be the custom. He said, if he had not taken the sacrament the day before, he would have knocked down Williamson, the lieutenant of the Tower, for his ill usage of him. He took the axe and felt it, and asked the headsman how many blows he had given Lord Kilmarnock; and gave him three guineas. Two clergymen, who attended him, coming up, he said, “No, gentlemen, I believe you have already done me all the service you can.” Then he went to the corner of the scaffold, and called very loud for the warder, to give him his periwig, which he took off, and put on a nightcap of Scotch plaid, and then pulled off his coat and waistcoat and lay down; but being told he was on the wrong side, vaulted round, and immediately gave the sign by tossing up his arm, as if he were giving the signal for battle. He received three blows, but the first certainly took away all sensation. He was not a quarter of an hour on the scaffold; Lord Kilmarnock above half a one. Balmerino certainly died with the intrepidity of a hero, but with the insensibility of one too. 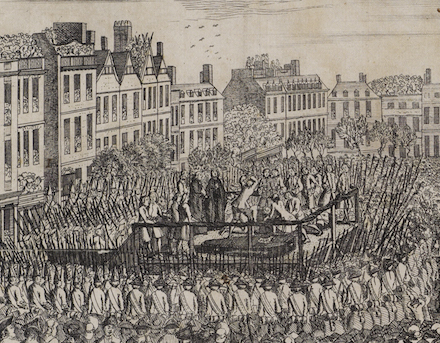 Detail view (click for the full image) shows London crowds thronging the twin beheading of Jacobite lords on August 18, 1746.